Find Your Inner Animal quizzes you on your personality traits, then tells you based on your answers what your true inner animal spirit is. WWF already had a popular version of this game up on their site, but it was several years old and Flash-based. Our mission was to spruce it up, refresh the illustrations, and make it a fun, responsive experience that could be enjoyed on mobile, tablet, and the desktop. One of the challenges of this project was illustrating a cohesive family of illustrations that encompassed straightforward things like "colorful clothes" to full-on environments like "in the ocean" to emotional and behavioral states like "lethargic." Each of these had to be clear and logical. Each answer option had a text caption to make doubly sure game players got the idea, but no one wants to do extra reading on a fun little animal quiz! The result was eight sets of illustrations that, whenever possible, follow along a spectrum and change only the important parts of each image for faster comprehension. The clothes on the clotheslines change colors and patterns, but don't change up between illustrations. The seasons come and go on the tree, but the tree itself doesn't change. 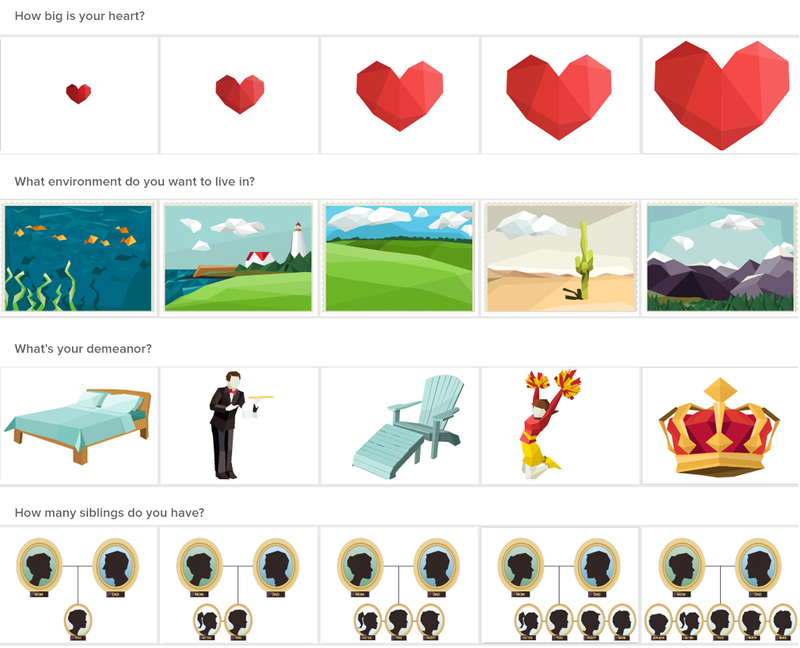 Limiting what's actually changing on each illustration helps keep the focus on just what exactly is different between option and helps a user pick the best answer for them. With so many different things going on, a really strong, distinct style is what ties all the illustrations together. A geometric, origami-inspired style tied nicely into WWF's existing brand and left lots of room for flexibility. I admit this was the first time I'd attempted the sharp, geometric look and after much trepidation and dread... it was actually a lot more fun than I expected! My advice for anyone wanting to dip their toe into this dramatic style would be to study up, research closely what you see working and not working on similar illustrations. Then put all that aside and just have fun. You'll be surprised which effects are difficult, which just don't work, and which look really great. 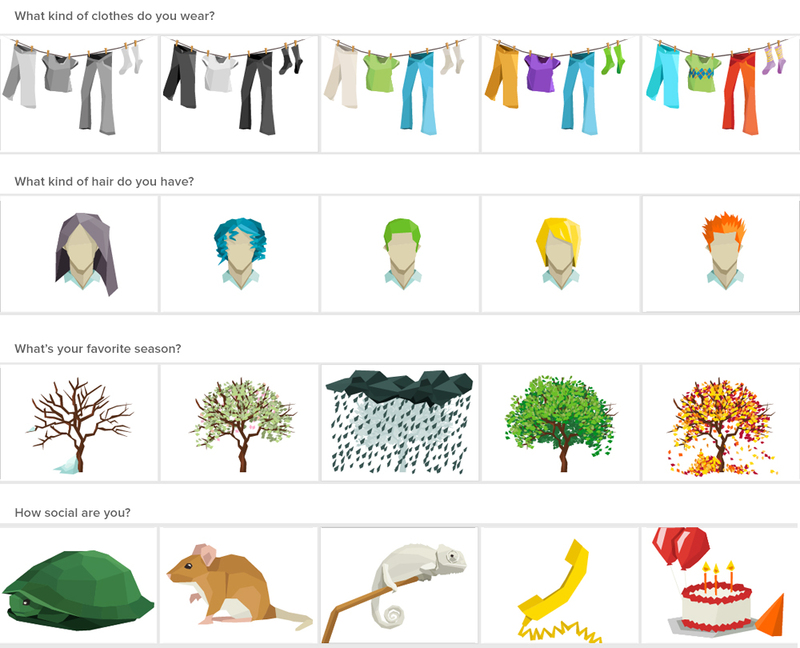 Eight questions, each with five choices, added up to forty individual illustrations! Like the Know Lupus project, the sheer number of illustrations unfortunately played a factor since I don't yet own a time-turner. If you're ever in a similar spot, I'd recommend planning ahead and getting minimum viable illustrations done for everything. You can always go back around after and make things nicer. 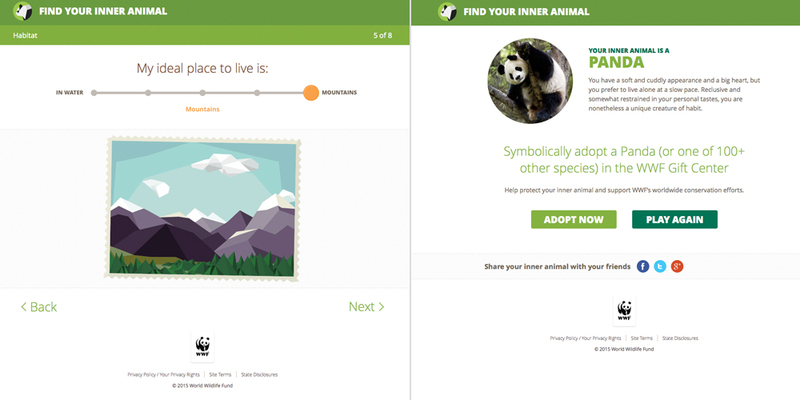 Check out the Find Your Inner Animal quiz! 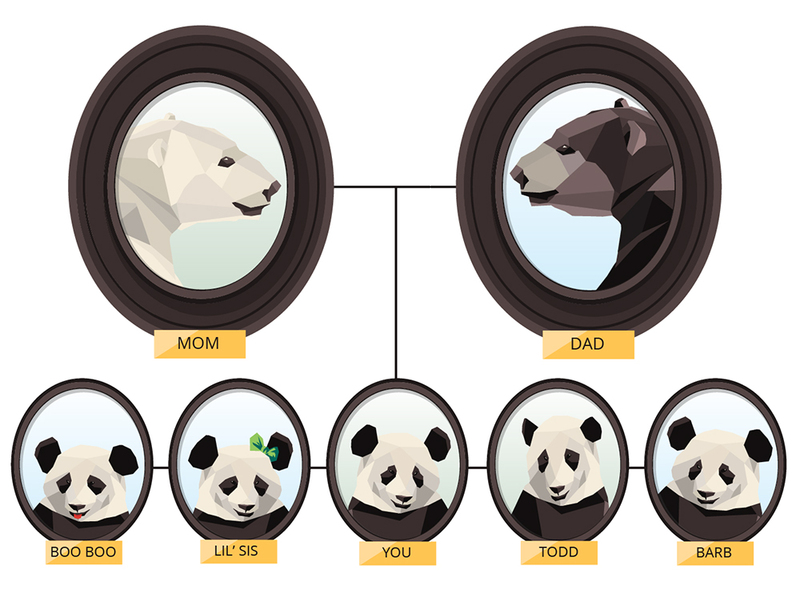 An early version of the family tree illustration for "how many siblings do you have?" featured a silly, albeit physiologically impossible, family before it was changed to something more educationally responsible.